BURBANK, CA – Fumio Demura, one of the greatest pioneers for opening the doors of traditional Japanese Karate to an American audience, played host to the screening premiere of his latest film, The Real Miyagi at the Martial Arts History Museum in Burbank last weekend. Demura, who was inducted into the Martial Arts History Museum's Hall of Fame in 1999, played the action role of Mr. Miyagi from the Karate Kid film series. 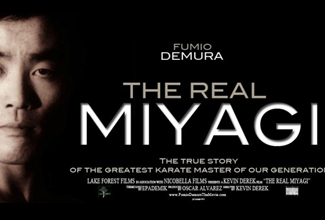 The release of his latest film, The Real Miyagi, is a documentary of the life of this incredible pioneer. “We are very proud of what we were able to accomplish by telling the life story of Fumio Demura,” notes the films' producer Oscar Alavarez and director Kevin Derek. The film has already won a number of Film Festival awards. “Having such an icon in the martial arts is a huge opportunity for the Museum. Demura, who gained notoriety in the martial arts world by demonstrating, along with Bruce Lee at the Long Beach International Karate Championships, has become the arts biggest advocate for promoting Karate throughout the world,” says Museum founder Michael Matsuda. Fumio Demura has graced over 50 international martial arts magazines and has authored numerous books on the arts and has appeared in countless movies and television shows. In the 1970s, he helped introduce the arts to the West as a performer at the Japanese Deer Park in Buena Park, CA. All proceeds from the screening were donated to the Martial Arts History Museum. For information about the Museum, visit Mamuseum.com. 2319 W. Magnolia Blvd., Burbank, CA. 91506. (818) 478-1722.